In America's Heartland, Building One Home For Three Faiths Three faith communities in Omaha, Neb. — one Christian, one Jewish, one Muslim — are leaving their old places of worship and building a new, single campus for their mosque, synagogue and church. 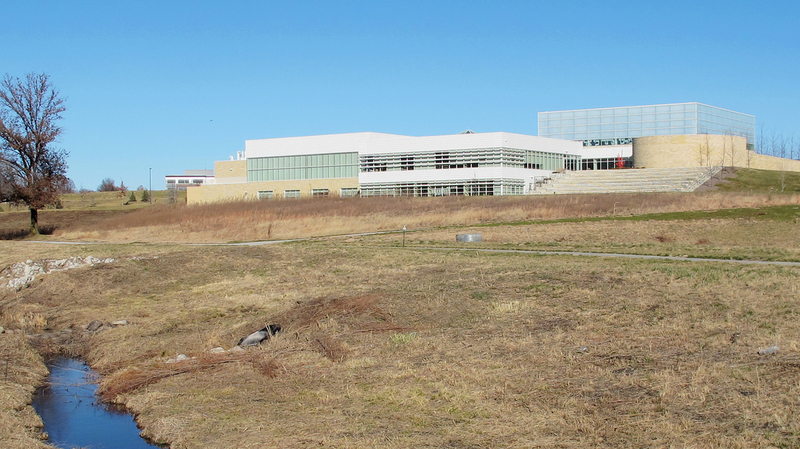 Construction has begun on the Tri-Faith Initiative's new campus on the edge of of Omaha, Neb. Here, a view of Temple Israel. It sounds like the setup to a joke — but it's not. It's actually happening in Omaha, Neb. The Tri-Faith Initiative may be the first place in history where these three monotheistic faiths have built together, on purpose, with the intention of working together. The project has inspired some, and antagonized others. In a tony suburban section of Omaha, kids at Countryside United Church of Christ are singing Away in a Manger. They're getting ready for the upcoming Christmas program. Upstairs, in the church's expansive, modern coffee shop, the Rev. Eric Elnes says this is going to be one of the congregation's last Christmases at this location. "We love our building. There is literally no good reason to move whatsoever, except to follow this Tri-Faith Initiative, which has really, absolutely moved our hearts," Elnes says. But the congregation will move — to a hilly, 38-acre plot bisected by a creek near the edge of Omaha. The church will sit in one corner, with a mosque in another, facing a beautiful new synagogue, built with stone quarried in Jerusalem. 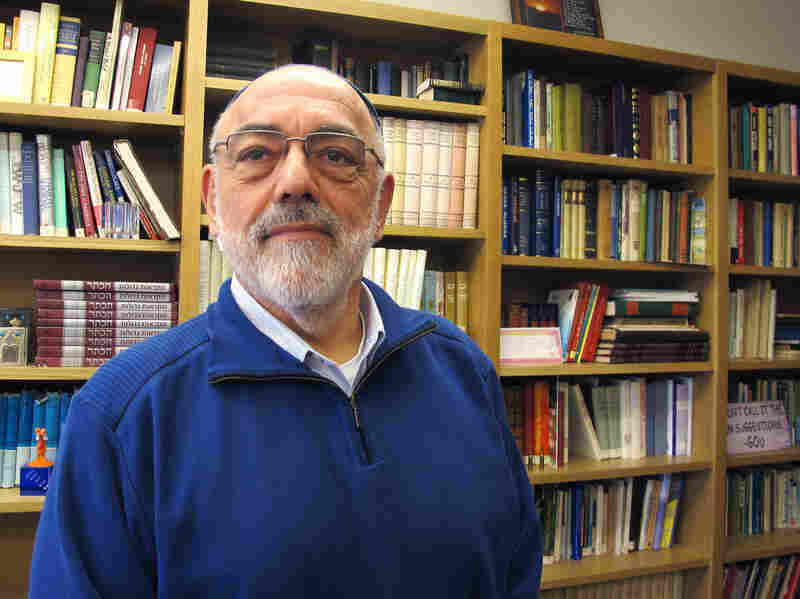 "This is something God wanted us to do a long time ago, and we were completely blinded by doing other things," says Aryeh Azriel, the rabbi at Temple Israel. Azriel says Jews, Christians and Muslims have a history of working together here. On Sept. 11, he and his congregants helped protect one of the city's mosques. When Temple Israel voted a decade ago to move to the suburbs, leaders envisioned a multiworship campus. Almost a micro do-over of the Middle East. Aryeh Azriel, the rabbi at Temple Israel, says the shared space is "something God wanted us to do a long time ago." "It's not a very good neighborhood in the Middle East, but Omaha is a unique place where those kind of relationships can exist," Azriel says. The American Muslim Institute, located in a small suburban office building, is the Islamic leg of the Tri-Faith stool. Karim Khayati helped establish it in part to promote interfaith cooperation. "This is a challenging time, and I think it's an invitation to work, and to love and to educate," Khayati says. "And that's what we're doing." But this temporary mosque doesn't attract many of Omaha's 6,000 or so Muslims — or reflect the anxiety that some, like Bassim Al-Ebadi, feel about mixing religions. "I believe it is not a good idea," says Ebadi, who runs the Green Land Market, a Middle Eastern grocery in an Omaha strip mall. He worries Tri-Faith could backfire, damaging the city's civil vibe. "Maybe something happen like in Israel, like in Iraq, or like everywhere. And then, maybe they will bring all the problems to America," he says. Another immigrant, Mark Christian, who converted to Christianity from Islam, worries that setting up a place dedicated to promoting cooperation among Muslims, Christians and Jews could provoke terrorists. "It is completely against the beliefs of Islam," Christian says. "And it is going to set my community and my city of Omaha as a target." All the more reason that it feels right, says Doug Dushan, a member of Countryside Church. He says attacking the foundation of extremist, separatist, ideology isn't just dangerous — it is exhilarating. "It does reinforce that I think any development in any faith have happened against the grain," Dushan says. 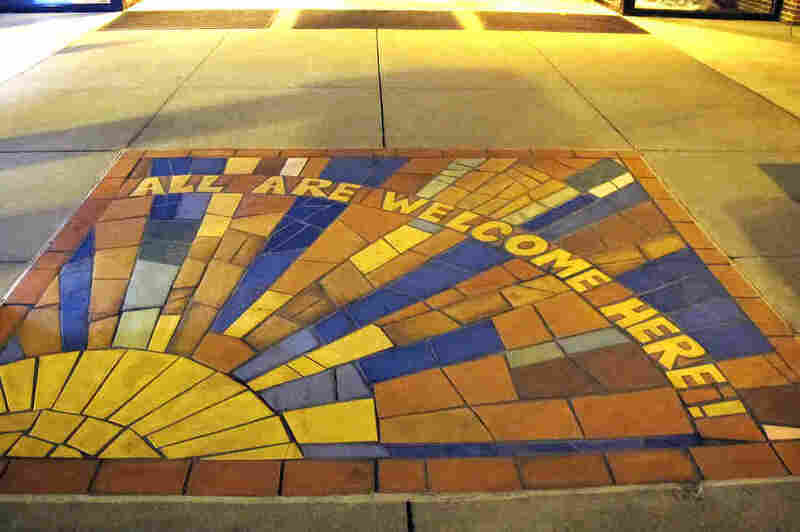 A mosaic in the sidewalk in front of Countryside United Church of Christ in Omaha. "We love our building. There is literally no good reason to move whatsoever, except to follow this Tri-Faith Initiative," says the Rev. Eric Elnes. Similar initiatives are underway elsewhere. One in Berlin would house all three religions in a single building. Elnes, the minister at Countryside, says it's part of a growing movement. "Right now, worldwide, what we see when we look at the three Abrahamic faiths," he says, "is that the progress end of all three of those faiths actually have more in common with each other than they may have in common with the extreme ends within their faith." Syed Mohiuddin agrees. A cardiologist, he heads the American Muslim Institute and is excited to complete the Tri-Faith campus, which should happen in the next few years. "We'll have music. We'll have parties," Mohiuddin says. "Food, food brings everybody together" — that is, after they work out the various dietary restrictions and hundreds of other small issues. The name of the stream running through middle of the campus, for instance, is Hell Creek. Azriel wants that changed as soon as possible, but Mohiuddin likes the symbolism. So as members of the Tri-Faith Initiative coalesce around high ideals and a historic mission, the devil may still be in the details.